Holashtak Announces the Arrival of Holi: The Festival of Colors is Back! Holashtak Announces the Arrival of Holi: The Festival of Colors is Back! Holashtak Announces the Arrival of Holi: The Festival of Colors is Back! Home » Interesting » Holashtak Announces the Arrival of Holi: The Festival of Colors is Back! Welcome the festival of spring, colors, and love! Yes, Holi is back with loads of joy and every heart has excitement to celebrate it. The colors are going to get brighter; the grudges are going to fade or will get lighter; the love is going to reside deeper. Because 'Holi hai'! Holi celebration is special in its own way, which starts from Holashtak. The first day of Holashtak period comes on Ashtami (eighth day) of Shukla Paksha in Phalgun (according to Hindi calendar) month. The day announces the arrival of the festival of colors- Holi. Some believe that Holashtak had begun when Lord Shiva got annoyed from Kamdev and became the reason of his death. This year, March 14, 2019 is the date that has marked the welcome note for the colorful festival. 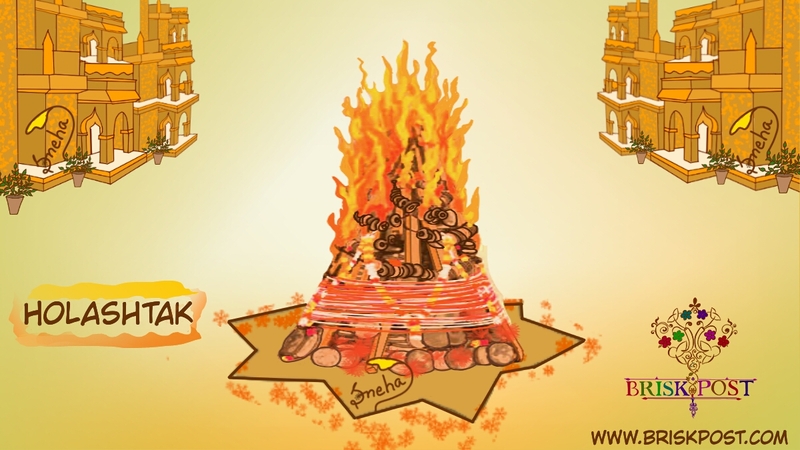 The period of eight days is said Holashtak that has started on March 14, 2019. These days come as a probation period for any auspicious event or ceremony like housewarming function, mundan-sanskar or marriage. People decide the place for Holika Dahan this day and clean that location with using the pure water of holy river Ganga. In order to accomplish the rituals, people start to gather the dried woods, dried cow-dung and grass. The festive days depicts the joy of the upcoming season as winter season gets ready to bid farewell and spring looms around. The season comes with the fragrance of new flowers and freshen-up the atmosphere with the grace and beauty of the weather. Holashtak has arrived on 14 March 2019 and will end on Wednesday, 20 March 2019. With Holashtak, Durgashtami is also falling this Ashtami of Phalguna's Shukla Paksha. Not only this, but Khatushyamji's fair is also falling in between on 17 March 2019. People who keep Rohini Vrat, it's a special day for them too. Well, the list doesn't end here and Dadu Dayal Jayanti is also falling the same day. Thus this day is pretty special with the weight of many auspicious occasions.